Emmys 2016 – Which news publisher won the Google News Boxes Mobile and Desktop? Top 3 Visibility: AMP Carousel Mobile vs. Google News Box Desktop. Emmy Awards 2016. In the following we will take a closer and more detailed look into the data. Let´s start with the results of Google News Desktop. As we can see in the following chart, there is no clear winner of the Google News Boxes Desktop. All results are relatively close together. Nonetheless we can see three “groups”. 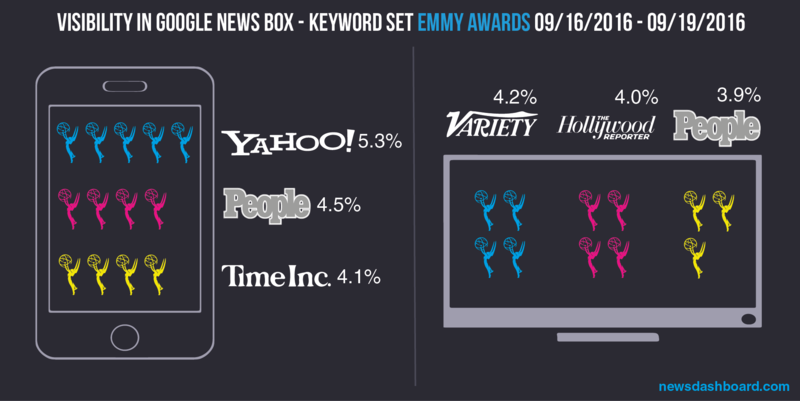 The Top 4 variety.com, hollywoodreporter.com, people.com and latimes.com had a visibility between 4.2 and 3.8 percent. On the positions 5 to 8 follow deadline.com, goldderby.com, ew.com and ibtimes.com with a visibility between 3.1 and 3.0 percent. On 9th and 10th position are eonline.com and usatoday.com with 2.5 and 2.2 percent. It´s obvious that most of the news publishers in the Top 10 put their focus on Entertainment and Stars topics. variety.com, hollywoodreporter.com, people.com and latimes.com had the highest visibility in the Google News Boxes Desktop. The Top 10 with the highest visibility in the AMP Carousels Mobile differ from the desktop results. While yahoo.com wasn´t in the Top 10 of the Google News Boxes Desktop, it is on first position in the AMP Carousels Mobile. The site had a visibility of 5.3 percent. On second position is people.com which also was successful in the Google News Boxes desktop. At third position is the mobile site of the Time Magazine timeinc.net. yahoo.com, people.com and timeinc.net had the highest visibility in the AMP Carousels Mobile. It is also striking that there are two British news publishers in the AMP Carousel Top 10: dailymail.co.uk (2.7 percent) and theguardian.com (2.2 percent). Other news publishers in the Top 10 are for example hollywoodreporter.com, latimes.com and eonline.com. In the Google News Box of the keyword “Veep” latimes.com, 6abc.com and abc7.com were on first position. 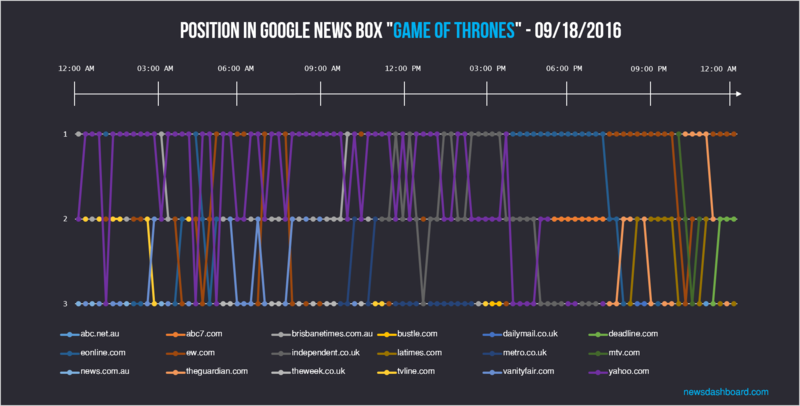 In the Google News Box of the keyword “Game of Thrones” there was a high fluctuation of the news publishers. The Google News Box of “Veep” had some “clear” winners: Between midnight and 3 pm latimes.com was most of the time on first position in the Google News Box, while cbsnews.com and yahoo.com were on second and third position. Later that day there was some fluctuation: 6abc.com and abc7.com conquered the first position while latimes.com “just” was on second position. 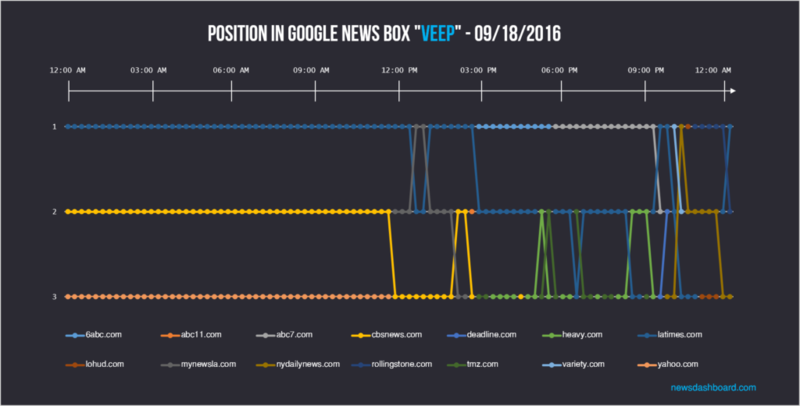 Other news publishers in the “Veep” Google News Box were – among others – heavy.com, nydailynews.com and lohud.com. The Google News Box of “Game of Thrones” had no clear winner. There was a high fluctuation at all positions. Yahoo.com was often on first position during night and in the morning, but not continuous. Meanwhile eonline.com, brisbanetimes.com.au or ew.com could pass yahoo.com. Between noon and 3 pm even a British news publisher was on first position: Independent.co.uk. In the afternoon until evening and night eonline.com, ew.com and theguardian.com alternately were on first position. 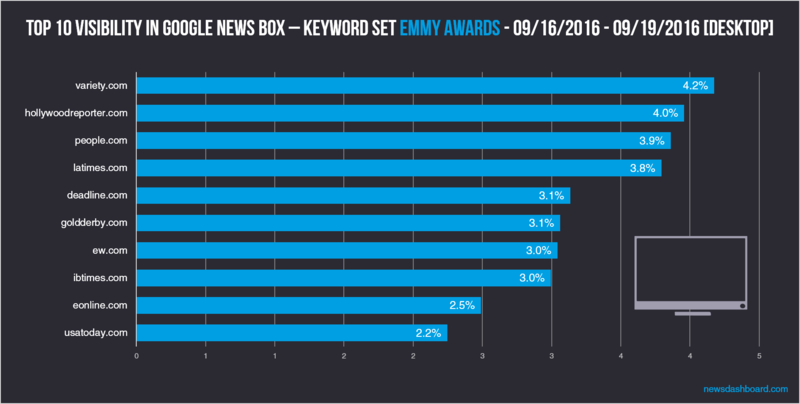 To sum it up: There was not one clear winner of the Emmys regarding the visibility in the Google News Boxes/AMP Carousels. 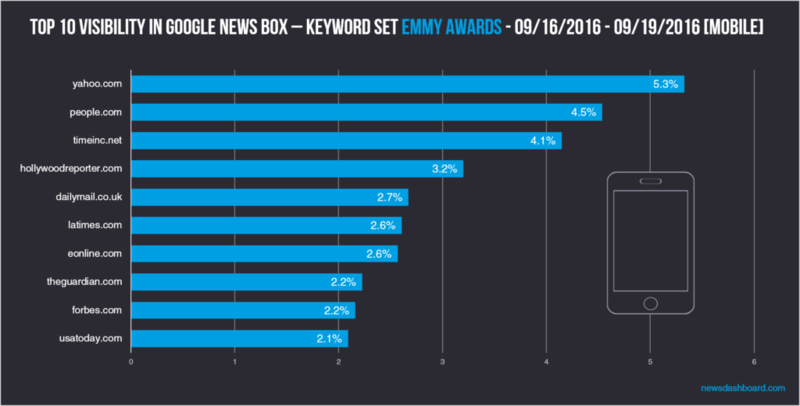 In the Desktop as well as in the AMP Carousel results all news publishers in the Top 10 were relatively close together. This can also be seen in the Google News Box of “Game of Thrones”. There was a high fluctuation: Many different news publishers were in the News Box during the day. Even this is the case three publishers jutted out for different reasons: people.com was able to get in the Top 3 for both mobile and desktop. yahoo.com was able to be first in visibility mobile/AMP carousels and hollywoodreporter.com was also able to get at least under the Top 5 in both categories. 68th Emmy awards 2016, Anthony Anderson, Ben Mendelsohn, Better call Saul, Black-ish, Bob Odenkirk, Claire Danes, Constance Zimmer, Downton Abbey, Emilia Clarke, Emmy Awards 2016, Emmy Awards 2016 date, Emmy Awards 2016 nominees, Emmy Awards predictions, Emmy nominations 2016, Emmy nominees 2016, Emmys 2016, Emmys 2016 winners, Game of Thrones, Homeland, House of Cards, Jeffrey Tambor, Jon Voight, Jonathan Banks, Keri Russel, Kevin Spacey, Kyle Chandler, Laurie Metcalf, Lena Headey, Liev Schreiber, Maggie Smith, Maisie Williams, Master of none, Matthew Rhys, Maura Tierney, Michael Kelly, Modern Family, Mr. Robot, Peter Dinklage, Rami Malek, Robin Wright, Taraji Henson, Taraji P. Henson, Tatiana Maslany, The Americans, Tracee Ellis Ross, Transparent, Unbreakable Kimmy Schmidt, Veep, Viola Davis.